I guess I forgot to disable that option again after reinstalling. The bar should be gone now; thanks for pointing it out. Our "total posts on all accounts" thing gave a totally different number in my post just now than it did in a post literally minutes prior. All my other posts say the same # as one of Lumi's posts does, and refreshing the page fixed it, but what's up with that? Why'd the number randomly change like that? Hmm, I really have no idea. Based on the number discrepancy, it looks like for a moment, it only counted that account (Lucilyn), and the primary account (Luminesce). Just a momentary fluke, I guess. The "All Accounts Posts" number is optional anyway and I wouldn't even be against removing it entirely, if people preferred it not be there. I personally don't know that I like it too much, but I guess it's a matter of "why not", unless users also don't like it. I like it, it says our system's really active! Even if we only have a hundred posts each or so, at least we might be recognized as long-time members? Also helps for Lumi's account so people get a better idea of how much his system posts as a whole, too. Like, people can tell it's not just him but we post too. Not that we add that much. A ton of our posts are in the Lounge honestly, like our entire Q&A thread. Lumi has 1500 posts instead of 1100 right now, because he doesn't post in forum games. I kinda wish lounge posts counted as posts. A ton of it is on-topic discussion that's just a little more lax than GD and Q&A. If I had to guess, the inaccurate total post count happens when you reply, before refreshing or going elsewhere. Does that sound accurate? If that's the case, it's entirely possible that no one else will ever see it inaccurately. There might be a decent number of tulpa-related posts in Lounge, but the threads don't fit the general on-topic standards, and shouldn't really be counted differently than the other Lounge posts, I think; especially at the cost of including all of Lounge. Including Lounge in post counts would give an inaccurate representation of a user's real forum contributions. Like Forum Games, but definitely less severe. As a matter of fact, if you count all posts in all boards, Jean-luc has the most posts of all users, despite having 1/4th the number of on-topic posts as the user with the highest. SomethingDire is only just behind Jean-luc, with only 320 on-topic. The reality is, there is more activity in the off-topic sections than there is in the on-topic, and I do not want the gauge of a user's contributions to reflect what they have contributed to threads such as "Stupid Jokes Thread". Well, I was implying Lounge only of course. 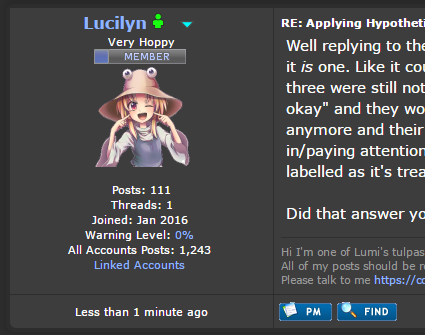 Because Lumi doesn't post in forum games his on-topic post count would be really high including the lounge. Anyways, I'm pretty sure since it posts and loads so quickly the forum doesn't have time to go check the others' accounts, just the master account and mine. It disappears if I refresh yes. For any of you who switch between the GoMobile theme and the default themes (dark or light), your images may not display properly. If rather than being embedded into posts, they appear as "[Image: http://www.linktopicture.jpg]", then go to the User Control Panel, Edit Options, and check "Display images in posts". You may also want to check the one for videos. These options were previously automatically disabled when going to the User Control Panel in the GoMobile theme, but I have fixed that issue now. I can't see the account switcher anymore, I swear it was there before the server switch?